GUYS I love cereal, do you love cereal? What I don’t love is sugar laden cereal that spikes my blood sugar and makes me feel like crap. Such a buzz kill, I know. It’s so filling, packed with nutrients, and full of healthy fats and fiber. What more could you want?! 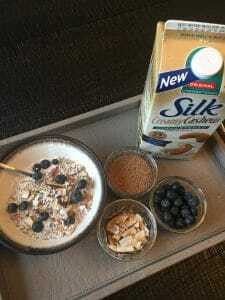 Mix together, cover with nut milk of your choice, and that is literally it! I pop mine in the freezer for a few minutes to let it get nice and chilly and allow the chia to thicken up a bit- I also love adding fresh or frozen berries (raspberries especially!) for a bit of added sweetness and flavor the milk with vanilla stevia drops to give that “cereal milk” flavor. This is a calorie dense meal for sure, but it’s a breakfast that will hold you over all day and is more than worth the calories. Think quality over quantity. These are QUALITY calories that are adding so much value to your day! You can alter the calories by cutting the recipe in half or play around with other nut/seed combinations! If you need more than 20 g of protein mix in a scoop of plant based protein (I recommend PEScience vanilla vegan)! 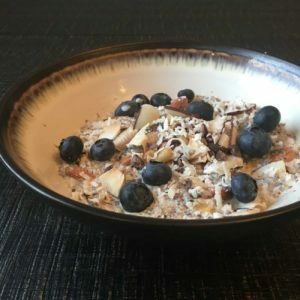 *Find this recipe on MyFitnessPal under “KY Keto Cereal” to track it easily!